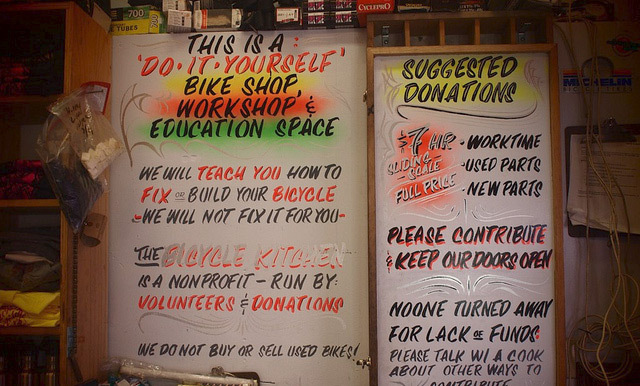 The Bicycle Kitchen is a nonprofit bicycle repair educational organization. 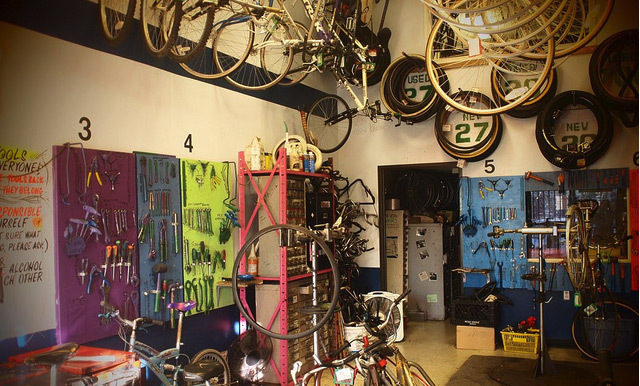 We are a group of volunteers who run a space in Los Angeles filled with tools and stands for working on bicycles. Our hope is that you will come down and work on your bike! We will help you. We ask for a SUGGESTED DONATION of $7 per hour (no one is turned away for lack of funds). We have almost every tool you could need and every shift at least one of us will be able to answer whatever question you may have...(hopefully). In Addition to tools we have tons of old donated bike parts and some semi-complete bikes, every now and then we get a fully operational bike. We do not buy or sell bikes, nor do we fix bikes for you. What we do is teach people to work on their own bikes. Many people already know how to work on bikes, that's fine too, we're here if you need us but we'll leave you alone if you don't... unless you'd just like to chat. Although we don't sell bikes we will price a "Project" and ask for a suggested donation. A Project is a bike you build at the kitchen with some or all of our used parts. A price is decided upon at the beginning based on the basic parts you will be working with and the amount you can afford. Remember--no one is turned away for lack of funds. 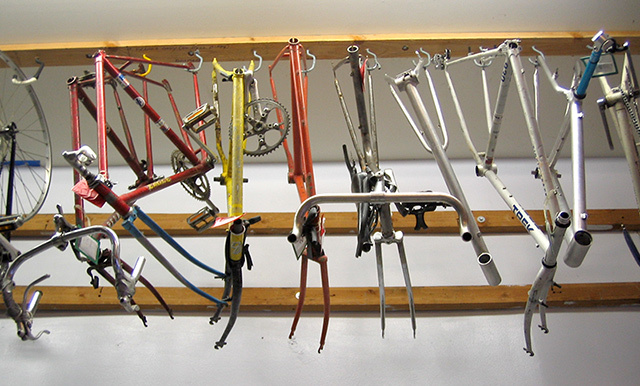 Many people have built entire bikes from our motley pile of old parts, often a few parts will have to be bought new. Every Project is unique. We just ask that you complete your Project Bike within 30 days of picking it out. Each of us, (roughly 15 volunteers) offer our time for different reasons, but mostly we all love bikes and we all think that a city filled with bikes is a good thing for lots of reasons. Working on a bike at the Kitchen is always more fun than watching television... even if it's a strangers bike. We welcome anyone and everyone; we won't laugh at you if your bike is the wrong color or yell at you cuz you want to put ape hangers on a 10-speed. One of the most common things we do is fix flats. If you don't know how to do that you should come down for sure and learn then you'll never be stranded again. Being able to work on a bike is very liberating. Once you learn about your bike, you'll learn more about "biking", and you might enjoy it even more than you already do. Our mission is to promote the bicycle as a fun, safe, and accessible form of transportation, to foster healthy urban communities, and to provide a welcoming space to learn about building, maintaining, and riding bicycles.